I don’t think I was fully aware of how physically active I was in high school, until at graduation when I looked back and realized I had played soccer, wrestled, and ran track all four years. I enjoyed competing, no matter how good or bad I was or at what level, but didn’t recognize how easy it was to stay fit when you always have a team with which to train. During and after college with the Navy, I had to learn how to be active on my own in order to pass two annual physical fitness tests. However, without a team I tended to get bored with a repetitive routine, and struggled to maintain my fitness throughout the year. It was on a deployment to Afghanistan in 2009 that I first tried Crossfit with friends. I was pleased both with the results and the fact that I no longer had to struggle with a “routine.” However, I was lacking the ability to perform Olympic lifts, couldn’t do advanced skills like double-unders, and unwittingly held myself back with only the internet for coaching. After moving to DC in late 2010, I continued cherry-picking Crossfit workouts I liked, as well as playing in recreational soccer leagues and working out with my Navy command. 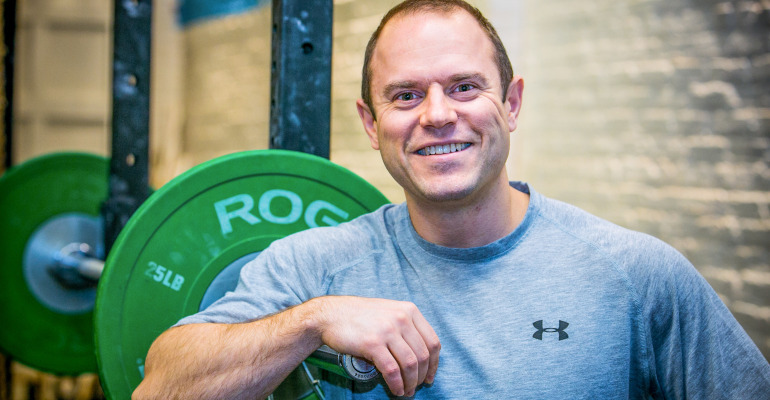 Eventually, I realized that I wanted [one on one] coaching to improve my all-around abilities, to meet more people in DC, and to permanently ditch my old “fitness routines” in favor of Crossfit. Alll of this led me to join MPH in late 2012, which has since met and surpassed my expectations. The community was incredibly welcoming and encouraging, the coaching has taught me skills I never imagined I’d have (hello, handstand walks! ), and pushed me to new levels of strength and endurance. Heading to MPH after work puts a smile on my face as I walk in the door – it’s the highlight of my day! Now, coaching at MPH has been a welcomed experience for me. Assisting an athlete to learn new skills and break through personal bests is a rewarding experience that usually teaches me something too. Much like in the Navy, no one succeeds as an individual, but everyone succeeds as a team.